Squirrel Plague Prompts Fears: Should You Be Scared Of The Black Death? A squirrel that was found with bubonic plague antibodies in its system has caused a touch of hysteria to infect some U.S. residents this week, as worrywarts bite their fingernails over concerns for the return of the so-called "Black Death." But should this actually be a cause for mass panic? Not really, say experts. The squirrel, which was trapped in mid-July in California's Angeles National Forest and underwent routine testing, prompted the closure of three sections of a California campground after tests revealed that the animal had been exposed to the bacteria that causes the plague. The Los Angeles Daily News reports Broken Blade, Twisted Arrow and Pima Loops of the Table Mountain campgrounds were closed Wednesday. As the rodent made headlines this week, netizens took to social media to express their concern. "Is [this] plague the same thing as THE plague, and is this how the world ends?" wrote one worried Twitter user Friday. "A squirrel in California has the plague. Should we be worried?" wondered another. The rodent had indeed been exposed to the same disease that decimated Europe in the Middle Ages. "It is the plague, the Black Death," Ken Gage, chief of Centers for Disease Control and Prevention's flea-borne diseases section in Fort Collins, Colo., told The Huffington Post over the phone Friday. As the CDC points out on its website, however, modern antibiotics are effective in treating the plague. Over the last few decades, the percentage of people in the United States who die from the plague has fallen dramatically. During the pre-antibiotic era, about two-thirds of all plague victims died from the disease; but nowadays, about 90 percent of plague victims who get prompt medical attention survive. It is also quite unlikely that you would ever contract the disease. According to the CDC, an average of 7 human plague cases are reported in the U.S. each year. Still, despite its rarity and relatively high survival rate, the disease, which is caused by the bacterium Yersina pestis, must be taken seriously. If untreated, plague can cause serious illness and death. Plague symptoms include fever, headache, chills, weakness and swollen lymph nodes. Earlier this year, i09's Esther Inglis-Arkell wrote about the disease, explaining "why people in the United States are still dying from the bubonic plague." She concluded that it's pertinent for us all to remember the deadliness of the disease. "The United States is one of the many countries around the world that technically still suffers from what was once called the Black Death. Although we're not keeling over like medieval peasants, there are regular cases of bubonic plague that spring up every year in the American southwest. Occasionally, they lead to deaths," she wrote. "[The plague is] incredibly well-known, but still almost unthinkable. No one seriously considers the plague these days, and a few scattered cases throughout an entire nation doesn't mean that people will recognize it when it comes." 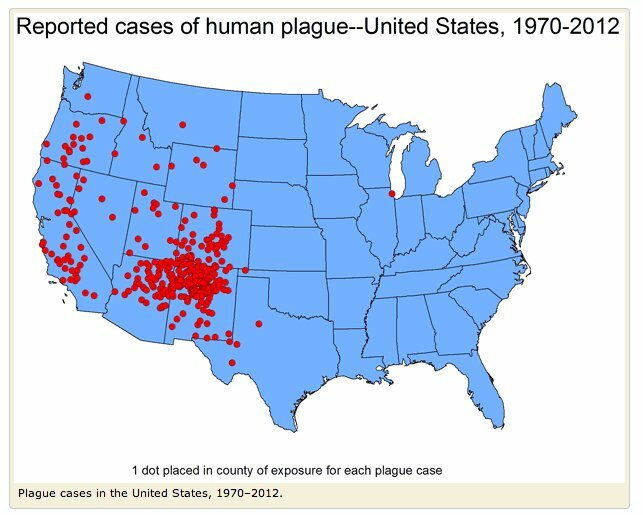 In the United States, human plague is most common in parts of New Mexico, Arizona, Colorado, California, Oregon and Nevada. [T]here are thousands of cases of human plague a year in central, eastern and southern Africa, South America and in large areas of Asia, and mortality rates are much higher in some areas with poorer access to health care. There is a vaccine available, but it is rare and only available to professionals who are at high risk of exposure. If you live in a plague-prone region, the CDC recommends taking steps to prevent catching the disease, such as keeping away from rodents and taking precautions against fleas. People typically contract the plague after getting bitten by rodent fleas or handling infected animals. Last year, a 7-year-old girl in Colorado contracted the plague after coming into contact with a dead squirrel, and a 59-year-old Oregon man caught the disease as he attempted to remove a dead mouse from his cat's throat. Both survived, though the man lost his fingers and toes to infection. As USA Today notes, the response to cases of plague in the U.S. is swift. The CDC's Ken Gage told the newspaper that states where plague is relatively common "are quite good at responding quickly" and have effective programs in place to control the spread of the disease. Ultimately, Gage says that we shouldn't be too scared of the plague, but insists that we cannot be blasé about it either. "We don't expect the plague to spread all over [the United States], but you can have localized outbreaks. The risks are not astronomically high but the risks are higher than normal," he told HuffPost. "The plague's very rare but if you get it, and you don't seek treatment quickly enough or if the medical professionals you see don't know what it is, you can die. If you know you're in an area where there's a plague outbreak, you must take precautions." Visit the CDC website to learn more about the plague in the United States. CORRECTION: An earlier version of this post indicated that three campgrounds in California had been closed due to the plague scare; however, a spokesman for the California Department of Public Health told The Huffington Post Tuesday that it had been three sections of one campground that had been closed. The spokesperson also told the HuffPost that though the captured squirrel was tested and found to be "seropositive" for plague, the animal may not currently be infected with the disease. "Antibodies to plague were found in the animal’s blood, and at some point previously, the animal had been exposed to the bacteria (Yersinia pestis) that causes plague. It does not mean that the animal is currently infected and that fleas feeding on that animal will become infected. California ground squirrels can live 2-3 years, so the squirrel could have been exposed prior to this summer," the spokesman wrote in an email. This post has been updated to reflect this new information.